Finally! Yes. I finally got the chance to write about my Tokyo adventure. Been putting this off ever since I went to Kyoto. Kyoto has that effect on me, I guess. 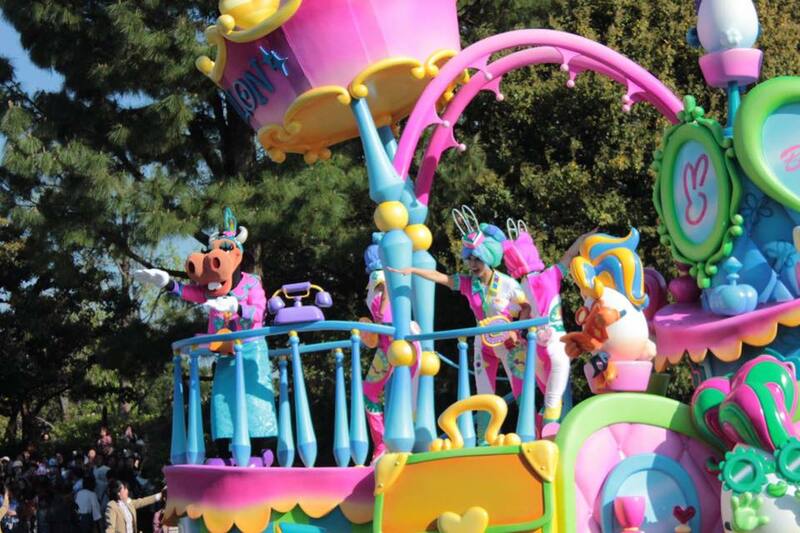 But lo and behold, Tokyo Disneyland still feels like a dream-come-true to me until now. 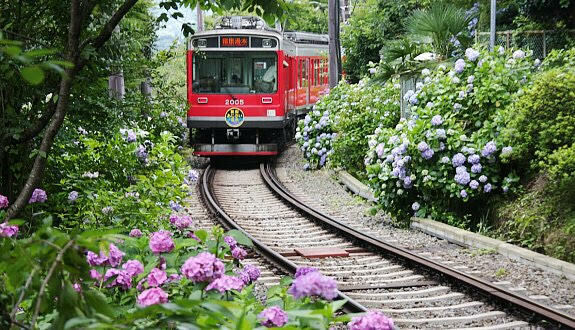 I've never dreamed of traveling abroad but I've always had a strong attachment to theme parks (including abandoned ones actually). So for this, I am just truly thankful. Childhood dream fulfilled! Tickets for two for Tokyo Disneyland! 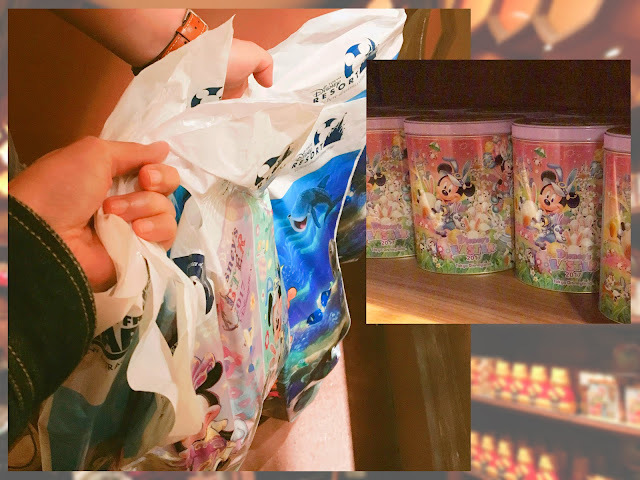 My good friend and I went to Tokyo Disneyland on a weekday last April. The seasonal event for that day is called 'Disney Easter' which runs for 3 months. 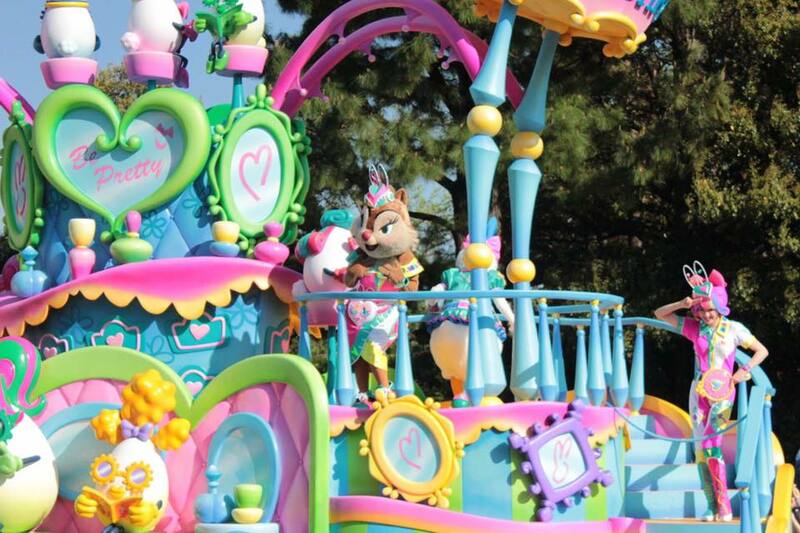 There were Easter eggs and bunnies all over Disneyland. During this season, the parade, the menu, and merch are prepared with Easter decors. And I got to tell you, they're undeniably cute! I will never forget Space Mountain. This is our first ride in Tokyo Disneyland. I'm not sharing the nitty-gritties here because, hey, who likes spoilers, right? But in case you're wondering, Space Mountain is one of those attractions with FAST PASS feature. My friend said the line gets usually crazy here so the plan was to get a Fast Pass first then roam around. Luckily, since we are (ehem) good runners , we were one of the first few people to enter without FAST PASS but with only 15 mins waiting time! The entrance to Buzz Lightyear Astro Blaster! Food in theme parks are usually spendy, Hong Kong and Tokyo Disneyland are no exception. What a beautiful view! It's A Small World attraction was closed during the time we visited. I'm not sure if it was undergoing maintenance but other attractions like the Pirates of Caribbean was closed too. Sigh. This is exactly my type of room! So intricate, classy, and baroque? Haha! It is just so, so breathtakingly beautiful! The main hall features the throne chair and Cinderella's glass shoes. I'm not posting photos of the important part of the attraction but.. TIP #3 take a photo of this painting without flash, then take a selfie with this as your background this time, WITH flash. You're welcome! A true-blue Disney kid will definitely enjoy Fantasyland Area. Recommended rides are Snow White's Adventure, Pinocchio's Daring Journey, and of course, my ultimately favorite Peter Pan's flight! Adventureland Area - now riding Jungle Cruise Wildlife Expeditions! Take advantage of the seasonal souvenirs and merch because every year is special. 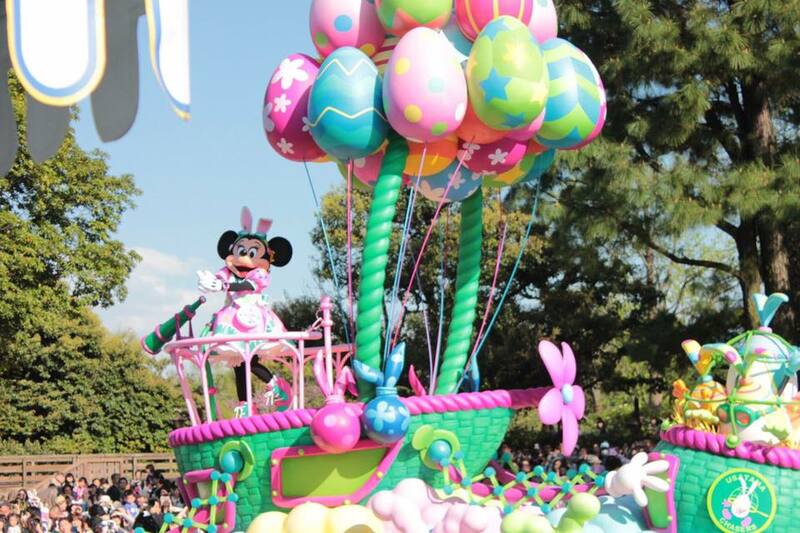 The Disney Easter theme for this year, for example, is popping colors of cyan, pink, and green. The color/theme changes annually per season and event. I wonder how things will look like during this Winter season? How about you, what's your favorite Disneyland ride so far? 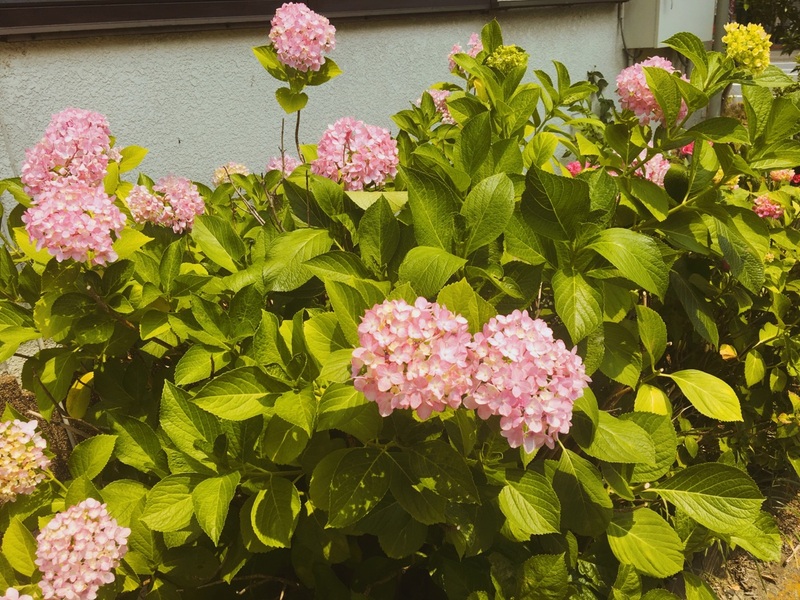 Hydrangea, known as "Ajisai" in Japanese, is my favorite flower next to cherry blossoms. Actually, I fell in love with it first before I ever saw my first Sakura. I came in Japan seven years ago during the Summer season so Ajisai is the first flower that greeted me when I arrived. What I really like about Ajisai is their variety in color and size. 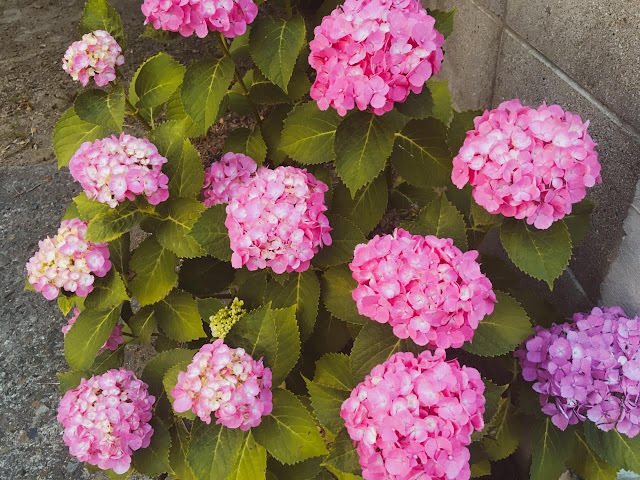 Most of them are big enough to pass as a mini bouquet. 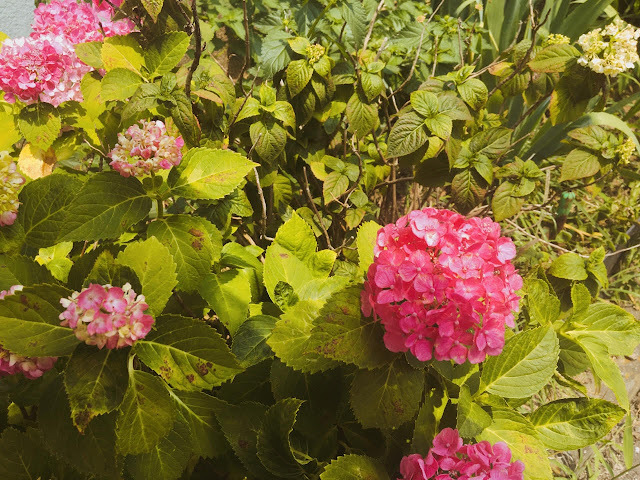 Some of them even outgrew their leaves that they look like colorful balls of fur floating around from afar. Just go imagine how beautiful they are! 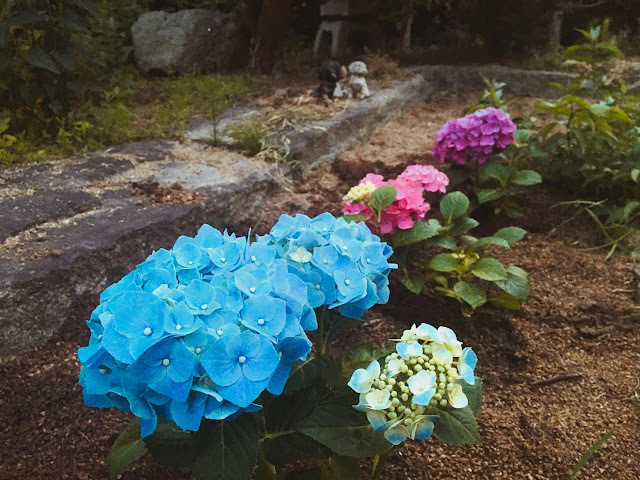 Newly planted blue, pink, and purple mophead hydrangeas in our backyard. 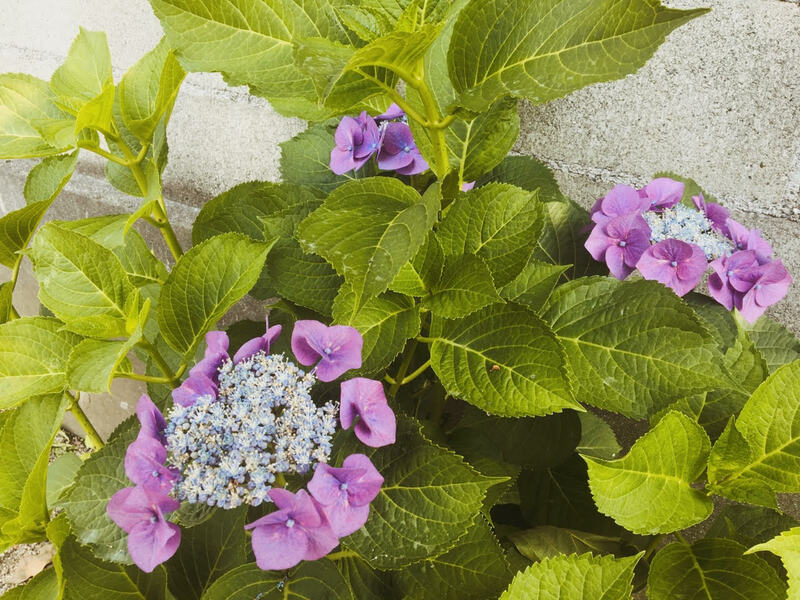 In general, Ajisai starts blooming from early June to mid-July (Summer). During this season, rain pours in most parts of Japan. It doesn't rain everyday, however, when it rains, one can expect intensive downpours and rains that last for a couple of days. 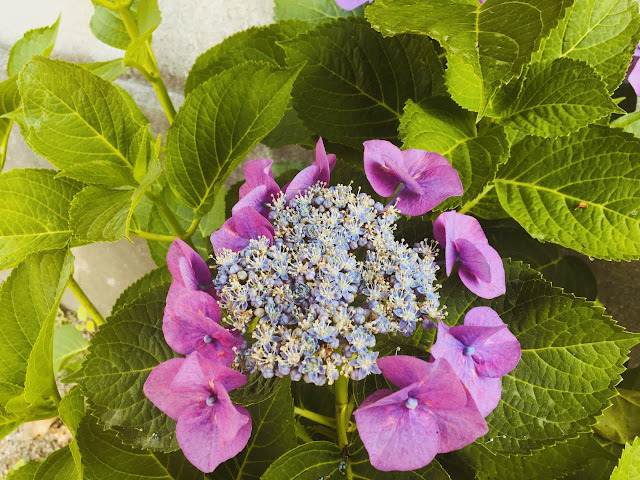 Here is another type of Hydrangea called "lacecaps" in purple color. 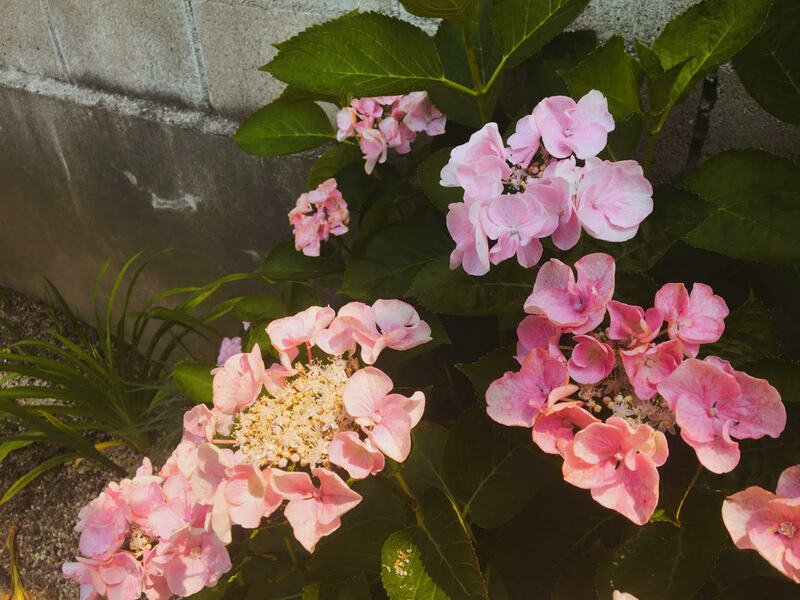 At first, I have no idea that it is actually another type of Ajisai until I did my research and noticed how similar their leaves are. 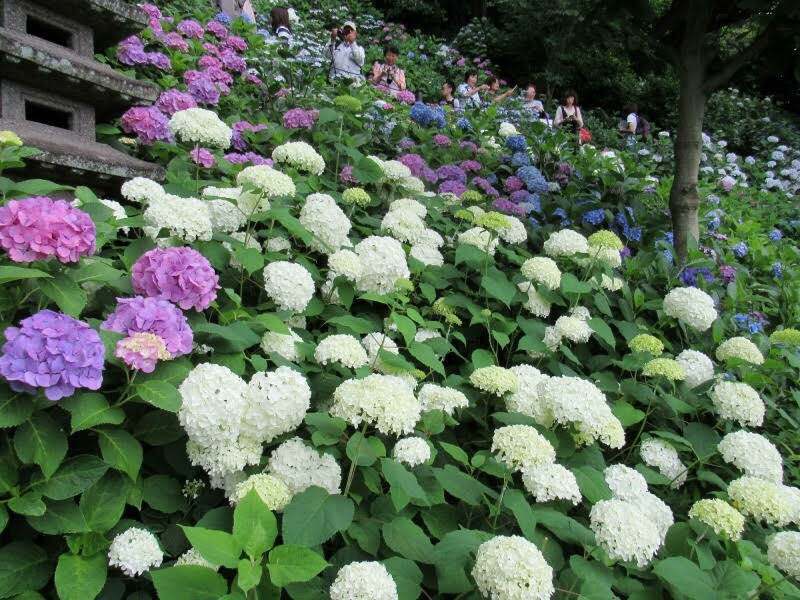 Where to see Hydrangeas in Japan? Hydrangeas can be found all over Japan. 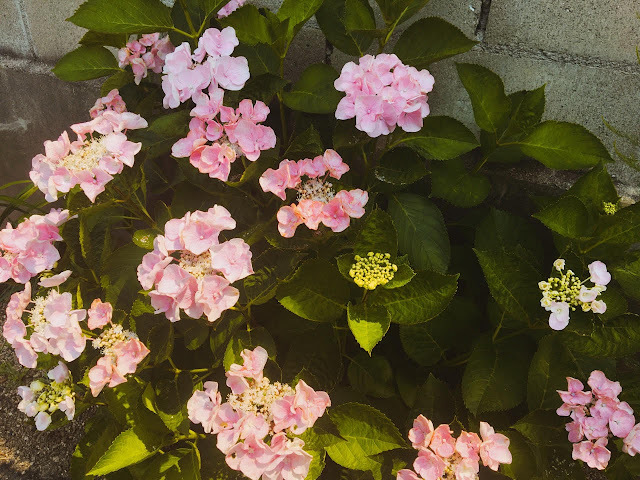 Some instantly grow at random places while some are willfully planted and maintained. 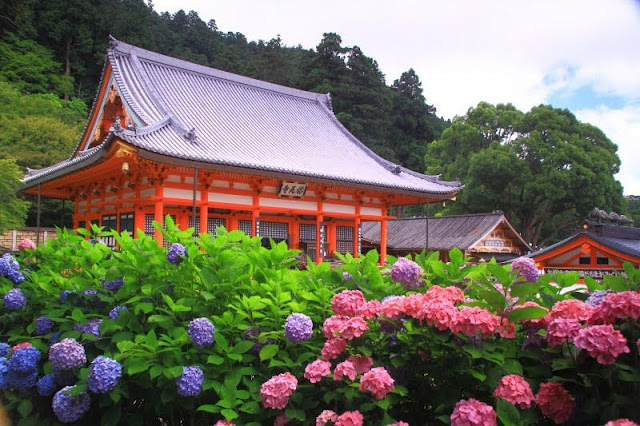 The beautiful Hydrangeas I know are maintained in flower parks and temples. 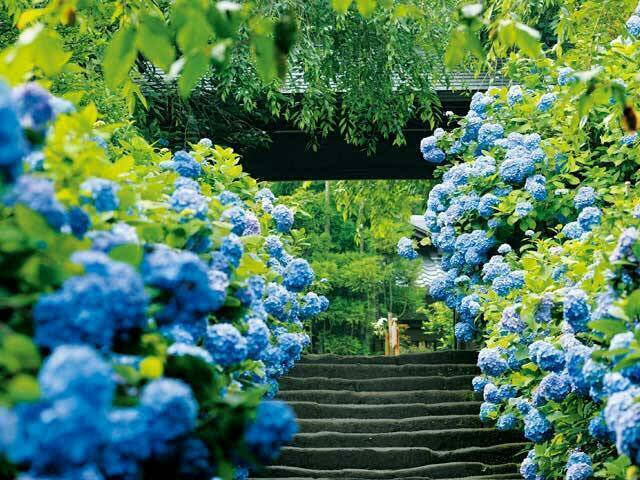 How about you, do you like Hydrangeas too?